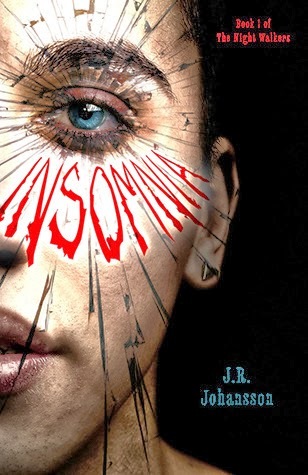 Yet another Whitney Award finalist for YA Speculative Fiction, Insomnia straddles the line between psychological thriller and horror novel, with strong elements of both throughout. Parker is a high school junior who, every night, experiences the dreams of the last person with whom he made eye contact. Some dreams are hilarious - his friend Finn's dancing pirates, for example - and some are terrifying - the school janitor's memory of murdering his wife. But they all disrupt his sleep, forcing his mind to stay awake while he experiences the emotions of the Dreamer. He hasn't had a full night's sleep in four years and it's taking a dramatic toll on his health and ability to function, until he runs into Mia (almost literally) one night. Mia's dreams are peaceful and calm, unlike any others he has ever entered, allowing Parker to rest. Parker becomes more and more desperate to ensure that Mia's eyes are the last ones he sees every day. He's convinced that his death is inevitable without the rest her dreams allow him to have - that without her, the Darkness in his own mind will take over - so he goes to greater and greater lengths to enter her dreams every night. Unfortunately, his obsession begins to frighten her. When she starts receiving strange, threatening messages, she believe they're from Parker and even he's not sure whether or not he sent them. Darkness and control are recurring themes. How much is Parker doing of his own free will and choice? How much is the Darkness within him controlling his actions? How does he deal with his own darkness and the darkness he sees in others through their dreams? As one character puts it, trying to convince Parker that he's not the danger to others he thinks he is: "We're all dangerous. We hurt others all the time without meaning to." But the fact remains that so much of Parker's ability is outside of his understanding and control, and he worries about the effects it will have on him and those he cares about. Johansson keeps a good, suspenseful pace in this novel, the first of a planned trilogy. However, there were several plot twists and leaps that didn't necessarily follow well for me. It's hard to write too much about them without spoiling the story, but the "bad guy" came out of nowhere at the end. I'm all for the twist ending, but there needs to be something the reader can look back at that makes the twist plausible; in Insomnia, I didn't think the seeds had been planted earlier in the story for it to make sense, it was just...convenient. There's also a mysterious character who keeps showing up and remains completely unexplained at the end, though I'm sure he'll be addressed in the sequel. Writing trilogies or series seems to be the new "thing", even for brand new authors. So many debut novels aren't stand-alone stories anymore, there has to be a planned continuation for at least two more books. In some ways that's great: authors get to tell more of the story without having to worry about capturing a huge following from the get-go before they can sell the rest of a series. But I wonder if it is detrimental in some ways, too. It almost felt to me like Johansson held back and didn't put as much into Insomnia because she knew she had to fill another book or two. SpokaneFAVS 2nd Annual Faith Feast!